Elevation Lab made a name for itself with the ultra popular Elevation Dock, which was introduced in 2012 through a Kickstarter project that brought in over a million dollars. Today, Elevation Lab is unveiling its newest dock, the ElevationDock 4, an amalgamation of everything the company has learned about docks over the course of the last five years. ElevationDock 4 features a compact design that's meant to take up minimal space on a desk. Adjustment knobs allow it to fit an iPhone and a case that's up to 3.5mm thick, and it's designed to work one-handed, a feature few other docks can offer. 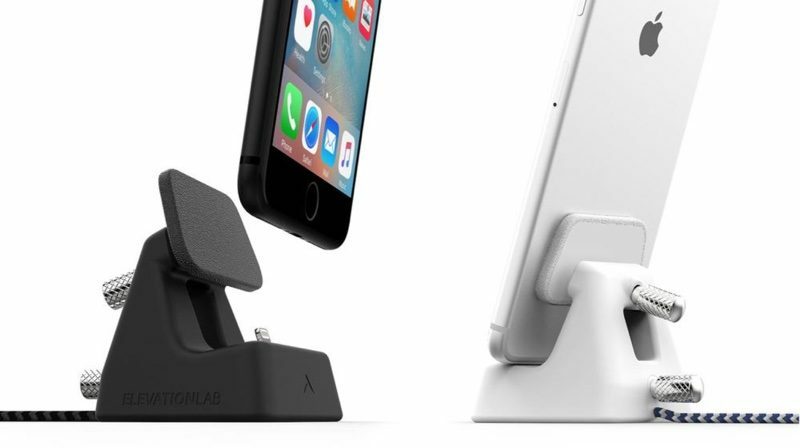 It has an 18° back angle with a +/-4° adjustment so the tilt can be changed for an ideal setup on a desk or nightstand, and the Lightning connector is designed to flex only under high torque to keep the iPhone stable and upright. The dock is Made for iPhone certified and comes with a built-in Lightning cable. Construction wise, it features stainless steel adjustment knobs and a medical grade silicone overmolded body. It's available in Matte White with a 5-ft braided blue cord or Matte Black with a 5-ft dark braided cord. Because of its study construction and stable base, the ElevationDock 4 is compatible with both the iPhone and the iPad. It will work with iPads as large as the 10.5-inch iPad Pro. ElevationDock 4 can be purchased from the Elevation Lab website for $59. Orders will start shipping out in two weeks. Could we at least get a "SPONSORED" tag somewhere on this obviously sponsored story? Furthermore, it's generally a good idea to have tracking URLs on sponsored links. Do you see any? Oh, you don't? That's because it's not sponsored. [doublepost=1504808807][/doublepost]I think it's funny every year when these companies come out with new docks ahead of a new iPhone. I never end up buying one precisely for this reason. Well this year they caught on—right? RIGHT?!? Well, it is adjustable. But the new iPhone is supposed to have inductive charging. And that's what's wrong with buying this now. It's always something, isn't it? They just can't get it right. Ships in 2 weeks...just in time for the wireless charging iPhone. And it does have an adjustable lightning connector for phones in cases. This important tidbit is missing in the article. Ultra-precise adjustment to perfectly fit your iPhone & case up to 3.2mm. Nice dock. But for $60, you must not be very creative on what to do with your money. This is entirely overpriced. You're paying for the "and let's make it ..." catch phrases in the video ad. It's not sponsored, MR will mention this if it is. This looks really nice! Thanks for bringing this to my attention MacRumors! That's not true. MacRumors uses Skimlinks which quickly applies the affiliate link to any eligible link when you click it, in the process of redirecting you to the site. Skimlinks is one of the largest reasons for the slow load times on MR. It has a huge impact on page speed and can even cause render blocks because of the position of the code on the site. It's also very simple to provide any data on link clicks to partners or others if this was a paid promotion, even without the need for a tracking code.